Discover the period gardens, history, customs, architecture and art that give Oakland Cemetery its distinctive character. 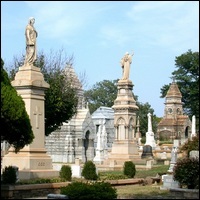 Founded in 1850, the cemetery is listed on the National Register of Historic Places and is a museum of Atlanta's history with more than 70,000 stories to tell - stories filled with victories and tragedies, both beautiful and stunning (including stories about Margaret Mitchell, Bobby Jones and Maynard Jackson). Visit the cemetery to take a stroll under the sweetly scented magnolias, study the intricately carved monuments, or take a tour with one of the skillful, enthusiastic and highly informative guides. Parking: Since Oakland was established in 1850 (before the automobile), parking inside the cemetery is limited. There is street parking and a parking lot outside the front gate. Parking is available inside, but please pull your vehicle off to the right side of any asphalt paved road, allowing room for other vehicles to pass. Please do not drive or park on any brick or graveled roads or on the walkways or grass. MARTA: Take the Blue or Green Line to King Memorial Station. Exit the station and walk south on Grant Street. Turn left at the stop sign onto Martin Luther King Jr. Drive SE, and Oakland's front gates will be ahead.